My husband, our friends, and I are all dressed up nicely, seated, eagerly awaiting our meal discussing life, work, and our friends’ announcement that they were getting engaged! We were happily chatting away, when in came eight or so college sophomores. How do I know their year? Oh, they made sure everyone in the restaurant knew they were there to celebrate finishing their second year, and that they had just come from a “rager”, on a Tuesday evening. Noice. Sadako is a smaller, casual Japanese sushi bar and café, and it’s generally pretty noisy & fun. This night however, it was especially busy and loud, because many students were having one last dinner with their friends before they went home for the summer. These particular students, who had clearly been drinking underage, and were now publicly intoxicated, were yelling at each other (happily, but obnoxiously), and swearing loudly and excessively. The tallest guy decided to ask the waitress why she doesn’t have “a real job”, to which she gave a surprisingly kind reply, and went back to serving the other patrons in the busy place. The entire time these kids were there, they were rowdy, rude, and uncouth. They ended up sharing a few orders of sushi, ate quickly, and stumbled out of the restaurant leaving a giant mess of spilled sodas and utensils on the floor, and no tip for the busy waitress. While it had been loud before they arrived, we were a few tables away from them and could still hear every single word they were saying, which was just so annoying. Yes, they are young, and yes they “just wanted to have fun”, but they were doing so at the expense of the other guests. It made me wonder why young people (and sometimes the not so young) seem to have difficulty understanding dining etiquette. This post is in no way intended to condemn those people, or anyone who has done these things in the past. Rather, this post is meant to serve as an introduction, or a reminder, for how to have the best experience possible when dining, and how to help others enjoy their meals as well! -Many restaurants expect your full party to be present prior to being seated at your table, regardless of whether or not you have a reservation. -Be sure to meet your friends on time! Being late, or “running behind” is not cool, but rather it’s rude and shows you don’t truly care about the people you are meeting. If you think it’s possible that you may run into traffic, leave 15 minutes early. -Once you’ve been seated and given a menu, decide what to order first, then chat. If you take the time they give you that is meant to select your meal to instead chit chat or text, you’re wasting the server’s time, and even those who are with you and want to eat. The server has a limited number of tables and if the place is busy, she makes more money if she “flips” tables faster. Making the waitress come back several times just because you haven’t yet looked at the menu wastes her time, and it delays your food’s arrival! The sooner you order, the sooner you can eat! -Remain off your phone when dining with others, you’re with them right now, enjoy your time with them! Other people can wait – unless it’s a true emergency, of course. -If you’re expecting an important call, let your companions know ahead of time that you may need to step away for a few moments. -If you absolutely must make a phone call, ask to be excused. A simple “I simply must take this call, excuse me.” will suffice. If possible, exit the restaurant (if it’s safe outside/not too dark/secluded), or stand near the maître de/hostess, out of the way of other guests. -Respect their allergies. If someone has a severe allergies, they will most likely let you know. -When ordering common allergens such as seafood, peanuts, or tree nuts, be sure to ask if any of your companions are allergic. If not, they will let you know, and you won’t have to ask next time. -If you have a food allergy, be sure to ensure that what you are ordering is safe for you to eat. It is not the staff’s job to read your mind. If you let them know, they will be able to help you make a suitable suggestion, or adjust their items to suit your needs. -It is not necessary to respect another person’s preferences, unless they specifically ask you to do so. For instance, my husband and I are vegetarians, yet we don’t ask our friends/family to not eat meat around us, because it’s a personal choice, and it’s no one else’s business what another person chooses to eat. -If you follow a certain dietary style, dining out is not a good time to tell them why they shouldn’t eat something, or why they should eat the way you do. -If you’re on a diet, it doesn’t mean those around you have to follow it too, so be respectful of what they choose to eat. -If the server asks your opinion of the food, be honest, but don’t be overly picky. If you ordered something you simply don’t care for, make a note to not order it again on subsequent visits. -If your food is cooked improperly, feel free to notify the server and request it be remedied. -If your food tastes wrong (freezer burned, the meat tastes off, etc. ), it is okay to let the staff know. They will make it right, and you should never eat something you think may make you sick. If the place you dine at is unable to cook their food properly, you may reconsider visiting again in the future. -Before I begin to eat, I always offer some of my meal to those around me, in case they’d like to try (especially when I’m with children. My nieces and nephews love trying new things, and you can help them explore new foods and flavors, as long as their parents don’t mind and it’s age appropriate!). I make sure to do this before anyone else (or I) start eating so that our utensils are clean. -If you’re sharing a meal, be sure to ask for an extra plate so that sharing is easier! -Don’t punish waitstaff by not tipping-that’s their livelihood. If the food is bad, consider dining elsewhere next time. -If the food is terrible, cooked dangerously, or your allergic/it’s against your diet to eat and not what you ordered, kindly alert the waitstaff and ask to have it fixed. If they have an attitude about it, consider not returning to that establishment. -Keep in mind that servers don’t cook the food, so they don’t control it. Don’t withhold a tip for mistakes another person made. -Putting a napkin in your lap helps prevent messing up your outfit, plus you look like a real adult! Woo! -Don’t make a mess. Sometimes accidents happen, but don’t think that just because you aren’t picking up after yourself that you don’t have to at least try to neat. -While it’s not necessary to stack your dishes, it takes only a second or two to pick up your napkin/straw wrapper/paper napkin holder etc. and pile it on the plate in front of you. -If you drop your silverware, simply ask for a new set. You don’t have to pick it up if it falls by your feet, but it’s simple to simply grab it and set it at the end of the table if you are able to easily reach it. -Do not snap/whistle/etc. to get the server’s attention, ever. You can wait politely for them to pass by. 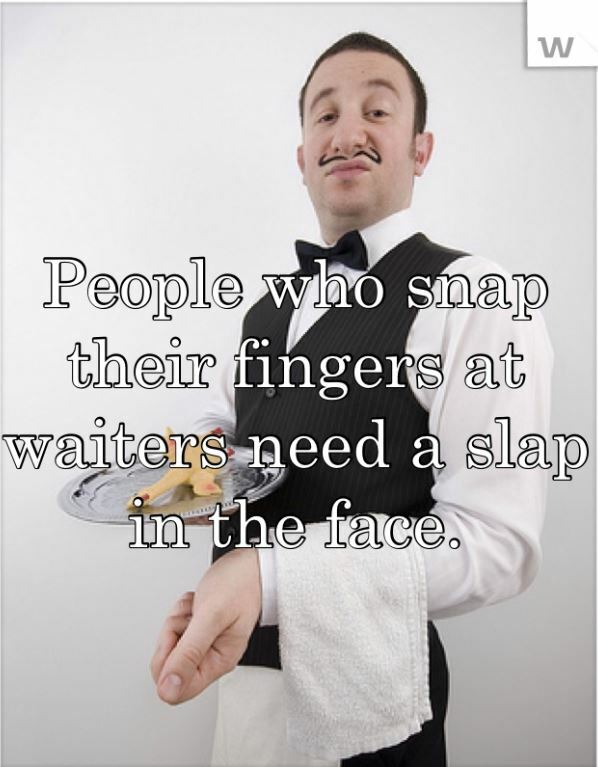 If you do snap or whistle, chances are you’ll become the bane of the entire restaurant, and the servers will avoid you. -Never order anything you can’t pay for – dining & dashing is rude & immoral, plus the server usually has to pay for your meal, which is also super wrong. -Even on dates, be sure you can pay for what you’re ordering, or the situation may get awkward if your date doesn’t offer to pay. This is also important in case the other person forgets their wallet. -If you invite someone to dine with you, offer to pay. For instance, saying something like “come to lunch with me” or “let me take you to lunch” implies that you’ll be picking up the tab vs. “Let’s meet for lunch”, which implies you’ll be splitting the bill. -The longer you stay at your table (of your own volition) the larger the tip should be. This does not apply if you are made to wait, then that is not your choice, and therefor there is no need to tip extra, unless the service was above average, of course! -Never tip less than 20% of the bill (plus extra if you’ve been there more than an hour and a half (I add $10 for every extra half hour we stay). I’ve had terrible service and still tipped. This is the other person’s livelihood. If they were cruel to you, insulted you, etc. then it’s up to you, because that should never happen. Just remember servers are people, and they have lives that shouldn’t interfere with work, but sometimes things happen. -I was dining out with my husband once and the waitress was awful. We had to repeat things to her over and over, she got both of our orders wrong, and it was like she wasn’t even listening to us at all. She dropped something on the floor because she set it on the edge of the table and began walking away. She never once refilled our drinks, and she just seemed all around uninterested in working there. The food was enjoyable, even though it was wrong. We had both just gotten paid and decided to try to brighten her day with a larger than normal tip. We left her a 100% tip on our bill, because we’d been there more than an hour (even though it was slow), and we wanted to do something nice for someone who seemed to be having a bad day. When she looked at the bill (which she did before taking it away), she began to tear up and she told us that her husband had passed away the month before, and she was very worried about caring for her children. She had apparently been a stay at home mom prior to that job, and had started there the week before, which was why she wasn’t very good at it yet (and not to mention her grief, which must have been absolutely unbearable). The moral of this story is that you never know what another person is going through, and how much they may need the money. When it doubt, always be kind. Also, I found a new meal that I enjoyed there which I wouldn’t have ordered otherwise – Yay! 50% divide bill in half and tip. =$6.49, which is 20% of the bill! There are also lots of Apps for this! -When dining abroad, tipping is not expected. It is okay to round up when abroad (e.g. $22.43 bill, pay $23). If you can’t afford to tip, you can’t afford to dine out. That’s simply part of the cost. -Don’t be passive aggressive to the wait staff if they aren’t paying enough attention to your table, they’re probably quite busy, and if they’re not, simply ask for a new waitress next time or go elsewhere. Everyone has bad days, and while they shouldn’t take it out on you, you never know what others are going through. -Do not stare at other people, or try to strike up a conversation with them simply because they are nearby. -Do not sit down uninvited at another table. It’s rude and uncouth. -Don’t call the waitstaff rude names. Don’t call a waiter “Chives” or “Jenkins” (unless of course that is their name on their name tag/how they introduced themselves), simply because they are serving you. -If you are unsure about how to eat an item, or unsure of what an item on the menu is, don’t hesitate to ask someone at your table, or the server! Let me know what you think of this guide in the comments below, and let me know if I missed anything! This is so great, I'm a server and I couldn't have said any of this better! The tip trick is so great! Very kind and thoughtful advice. Thanks for sharing! Thanks Dawn! I appreciate you reading my blog! Leaving a good tip is so important. I do not think you should go out to eat if you do not plan on tipping.